South Africa have been boosted by the return of back-row forward Heinrich Brussow and scrum-half Fourie du Preez for Saturday's Tri-Nations clash with Australia in Durban. The duo, who return to the Test match stage having missed the entire 2010 season due to knee and shoulder injuries respectively, will form part of the most experienced team in the history of Springbok rugby with a combined total of 810 caps. Coach Peter de Villiers has made 13 changes to the side that were beaten by the All Blacks in Wellington on July 30 with many of those players who controversially sat out the recent defeat to Australia and New Zealand returning to the fray. Captain John Smit and Rossouw are the only survivors in the starting XV from the 40-7 drubbing in Wellington; another three players in Morne Steyn, Jean Deysel and Gerhard Mostert have been retained among the replacements. The selection also marks the return for the first time in a year of another four players - JP Pietersen, Jaque Fourie, Butch James and Gurthrö Steenkamp - who all missed the end-of-year tour because of injury. "We still have a number of leading players unavailable through injury but this is the strongest squad we have been able to choose from since 2009," said De Villiers. 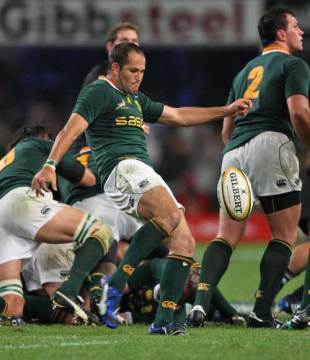 "It's great to have Fourie and Heinrich back as they were two of the leading players in world rugby when they last played in 2009, and they contributed a lot to Springbok success that season. This is the first step back for them, but we're looking to them to have the same impact in due course." "This team has vast experience and a strong leadership core, but that counts for nothing at kick off on Saturday," said De Villiers. "This Australian team are no respecter of reputations - we saw that last year in Bloemfontein - and we know just how dangerous they can be. "They will be highly motivated and hurting after their last result and they have a good recent record against us. They will know we have just come together and they'll be looking to exploit that."